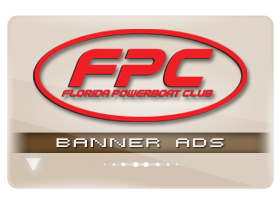 Advertise with Florida Powerboat Club! 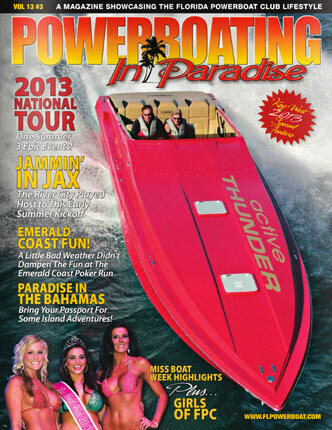 Want to see your ad featured in our Powerboating in Paradise magazine? 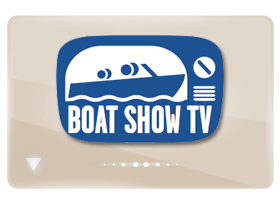 How about your commercial, which can be run during an airing of Boat Show TV? 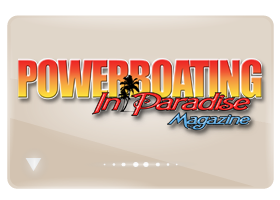 Florida Powerboat Club offers these advertising options and several more! With a variety of medium channels to chose from, our selection can be used to suit your advertising needs. We have you covered from web to broadcast! Our materials also reach a broad spectrum of enthusiastic and unique viewers, allowing your advertisement to reach a variety of fresh potential clients. Our competitive rates along with our advertising options make advertising with FPC a great move for your business! 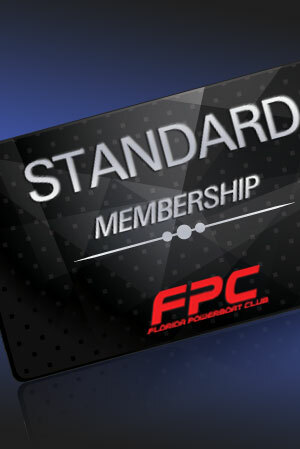 Interested in what Florida Powerboat Club has to offer? Continue scrolling or click the links below for more information on advertising with FPC! 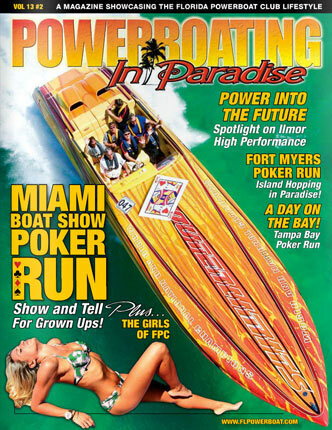 The Powerboating In Paradise TV series showcases the adventure and excitement of Florida Powerboat Club’s poker run events from around the Sunshine State. Shot by professional videographers from helicopters with the doors removed! The incredible camera angles and high-powered sound of thundering performance boat engines puts viewers right in the cockpits of these awesome offshore powerboats. 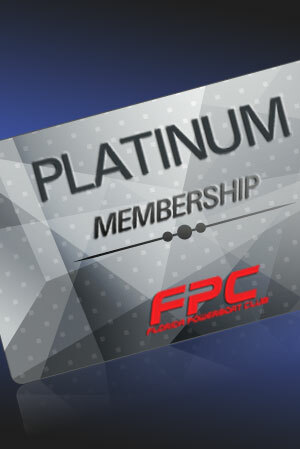 Join us as FPC members from around the globe throttle up to exotic destinations in paradise. Florida Powerboat Club founder and president, Stu Jones, produces, directs and hosts the half-hour sports show, ensuring that viewers are well-informed about the people, the places and the power boats of FPC. 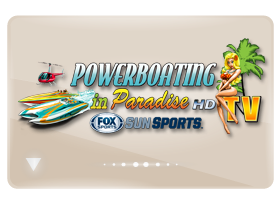 Powerboating In Paradise has been featured on several other television networks, including E! Entertainment, The Travel Channel, Maximum Marine on Speedvision, and the Powerboat Television Show and CAN BE SEEN NATIONALLY on SUN SPORTS, a Fox Cable Network. Are you ready to join FPC? Customized TV programs available with attractive discounts! Download the ad contract to get started today! 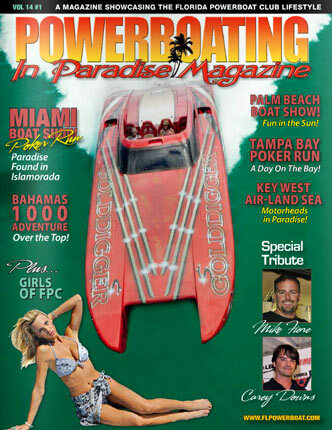 Powerboating In Paradise showcases all of the excitement of Florida Powerboat Club’s poker run series and special events, in a colorful high-quality magazine that is published two times annually. At the heart of the content, are the members of the Florida Powerboat Club, enjoying weekends in paradise aboard their sleek, powerful offshore escape machines…including the top names in the world of high-performance boating! 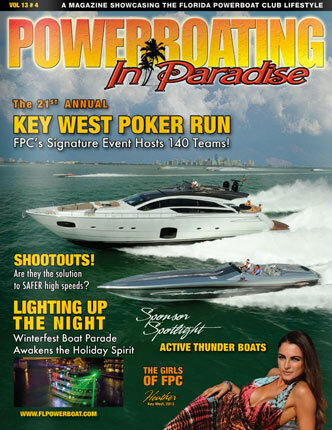 15,000+ copies to FPC members, sponsors, affiliates, marine trade, Florida marinas state-wide, and nationwide poker run events. “15,000+ Copies in Circulation”To advertise in one of the longest standing powerboat publications to date, please give us a call. Contact us for a current advertising contract. 2015 Volume 15 #2 — Final submissions by September 10. Based on our research and our experience producing television for nearly two decades, we understand the importance of building relationships with our advertisers and are offering attractive discounts to get your started. YOUR actual inventory — new and used— plus any additional information about your store, events, etc. MANUFACTURER action footage of boats running in the water acquired through your factory reps.
Production costs start at $250 and depend on content and video scheduling. Standard airtime rates are a flat fee of $695 per 30 second commercial. ALL EPISODES AIR 4-6 TIMES OVER A TWO WEEK PERIOD. When you purchase a segment feature OR a commercial placement, ONE price will include all 4-6 broadcasts of your advertising message! Let Your Ad Be Seen Online! Do you want your ad to be viewed on one of the most easily accessible platforms for your target audience? Advertise your business with an FPC banner ad! Easy and Effective With an affordable range of advertising programs available, there’s no reason to wait for your ad to be seen! Check out our website facts to the right to get more info on how partnering with us will be one of the best advertising choices you could make! Our website boasts a variety of multi-media content, which will also attract your target audience. Contact Us Today! FPC draws in unique views each month, meaning more reach for your advertisement… Contact us today for more information on how to get started! Visitors to our website are very enthusiastic about boating, powerboating and the marine industry in general. Our site features videos, full length episodes of our tv show, photography and an online magazine. On average, we receive over 100,000 page views per month nearly 60% of which are new visitors. We have many options available starting as low as $75 per month. Your ads can be both 468×60 and 175×600 in .jpg .gif and .swf format. Please contact our office at 954-545-1414 and get started today.